Industry-leading printing performance, Improved Reliability, Ease of Use. The Seiko-Instruments Qaliber RP-E Series with an innovative, cubic, design, and a small footprint of 129mm x 129mm x 129mm, make it the most compact in the market. The Qaliber RP-E Series generates a receipt at an industry-leading printing speed of 350mm/s. Together with a cutter life of 2 million cuts and 150km thermal head abrasion resistance this printer is a reliable companion in your daily operations. The optional front and top paper exit provide a great flexibility. 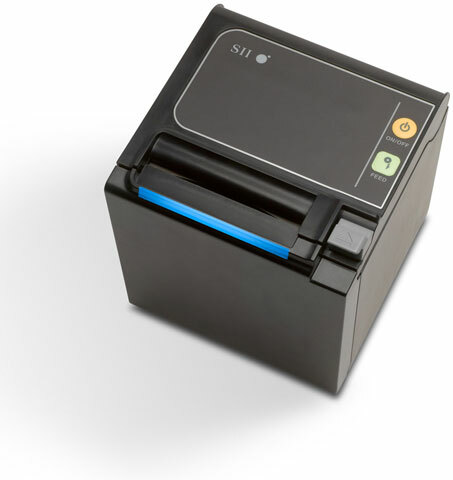 A large LED bar and an optional buzzer sound inform the user of the printer status. Apart from the standard interfaces (USB and serial), powered USB, Ethernet and a unique USB and powered serial version are available. The printer comes in black or white, a wall mount kit is available. The Seiko RP-E10-K3FJ1-S2C3 is also known as SEI-RPE10K3FJ1S2C3	or RPE10K3FJ1S2C3	.